RenÃ© Harrop records lessons learned from years fishing the world's toughest trout water. His home water, the Henry's Fork, is one of the most challenging spring creeks in the world, and over his lifetime fishing the Henry's Fork, he has developed legendary techniques and flies to meet the challenge.In Learning from the Water, RenÃ© shares his wisdom on the importance of insect stages, the flies for a successful fly box, and how to plan and prepare for a trip to unfamiliar water. Chapters on midges, caddis, Flavs, Callibaetis, Tricos, PMDs, hoppers, beetles, aquatic wasps, and Baetis give solid inside information on each of these important insects as well as the patterns RenÃ© uses to imitate them, patterns that inspire fly tiers the world over. 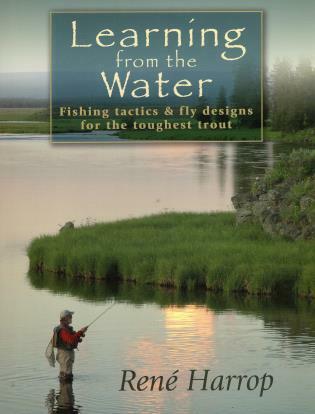 René Harrop is also author of Trout Hunter (978-0-87108-922-9) and writes for Fly Fisherman. A fly-tying legend especially known for his pattern designs with CDC, René has run his own fly-tying shop, the House of Harrop, from his home on the banks of Idaho's Henry's Fork since 1968. A true family business, House of Harrop also employs his wife, Bonnie, and children, Leslie and Shayne.